By Hank Hanegraaff; Thomas Nelson, Nashville, Tenn., 2009; 426 pp., hardbound, $22.99 retail. It’s a two-year-old volume, yes, but it’s worth an evaluation, especially for those who missed either this edition or the original version that made something of a splash 14 years ago. 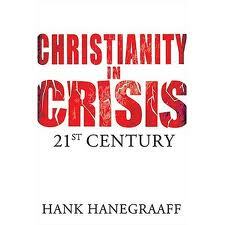 Hanegraaff’s 1997 work (titled simply Christianity in Crisis) dissected the so-called “Faith Movement,” aka the “Word of Faith Movement.” His revised edition, titled Christianity in Crisis, 21st Century, updates his case against the same individuals, while adding a few names (and their respective controversies) to the mix. Interestingly, a critique of the Faith Movement becomes, almost by default, a critique of televangelism in general. The giants of “Faith Theology” are, by-and-large, the giants of televangelism. Maybe not exclusively so, but largely so, and tellingly so. Hanegraaff says little or nothing about this close correspondence, but it’s worth at least passing notice. Hanegraaff’s targets are such figures as Rod Parsley, Kenneth Copeland, Benny Hinn, John Hagee, T.D. Jakes, Creflo Dollar, and others. It is something of a surprise to see him extend his criticisms to such names as Joyce Meyer or (more surprisingly) Joel Osteen, but Hanegraaff is hardly less critical of them than the others. The author, who has penned a number of books on Christian themes, heads the North Carolina-based Christian Research Institute (CRI) and hosts a daily radio show that airs in the United States and Canada under the name “the Bible Answer Man.” CRI operates the equip.org website and publishes the magazine Christian Research Journal, which also can be found online (http://journal.equip.org). Employing an approach that is at some times adroit and revelatory, at most times workmanlike, and at almost all times denunciatory, he takes apart his subjects one by one. There’s some hyperbole, to be sure. In Hanegraaff’s hands, an extravagant declaration by John Hagee on camera at Trinity Broadcasting Network becomes not just a ridiculous remark but “one of the most horrifying scenes I have ever witnessed.” Benny Hinn’s ill-advised contention that Jesus would have sinned if not for the help of the Holy Spirit becomes, for Hanegraaff, “unnerving.” TBN founder Paul Crouch’s remark that Jesus’ divinity departed Him on the cross and returned to Him in Hell becomes not just an error but “a spiritually horrifying notion.” And while Hanegraaff does not repeat himself—at least not to excess—there is nonetheless a feeling of repetition. It’s not Hanegraaff’s fault. The characters that he dismantles are so alike in their appeals and approaches that each new chapter brings a dose of déjà vu. So much so, in fact, that by the midpoint of the book (around page 200), the idea that there’s another 200 pages of this march still ahead—well, it’s a thought that crosses one’s mind. And then there’s the acronyms. Hanegraaff leans heavily on them as instructive devices, and we are shepherded through chapters covering such breakdowns as F-L-A-W-S (Faith in Faith / Little gods / Atonement Atrocities / Wealth & Want / Sickness & Suffering), F-A-C-T-S (Faith / Adoration / Confession / Thanksgiving / Supplication), the F-A-C-E of Evolution (Fossils / Ape Men / Chance / Empirical Science), and the M-A-P-S of Bible authority (Manuscripts / Archeology / Prophecy / Scriptural Synergy), and more. And yet for all of these idiosyncracies, Christianity in Crisis, 21st Century is a book that needed to be written.